Construction drawings are the culmination of the owners specific design conditions, site layout, structural coordination, material specifications and building and energy code requirements. This information is assembled in large-scale drawing format and is used by the builder and his subcontractors for pricing the job (bidding), obtaining a building permit and for construction. The greater amount of detail included in the drawings, the clearer the procedure for construction, and the more accurate the bid will be. Without detail, the builder may utilize standard practices and finishes to perform the work. If something is desired other than standard practice, it must be called out in detail in the drawings. The drawings become an important document in assuring the house, renovation or addition is built the way the owner wants it and provides more control over the end product. This is important from a financial point of view and to provide the most accurate pricing. A full set of construction drawings is geared toward a project that will be bid on by multiple contractors to get the best price from a competent builder that the owner is comfortable with. This includes the most information, where all decisions have been made up front to obtain accurate costs. Code information, plans, elevations, sections, details, schedules and a project manual are included in a full set. A builder’s set of construction drawings is done in a minimal way to show the basics for a builder to obtain a permit to construct the project. Builder’s sets are typically done for a contractor or owner that has already chosen a builder. 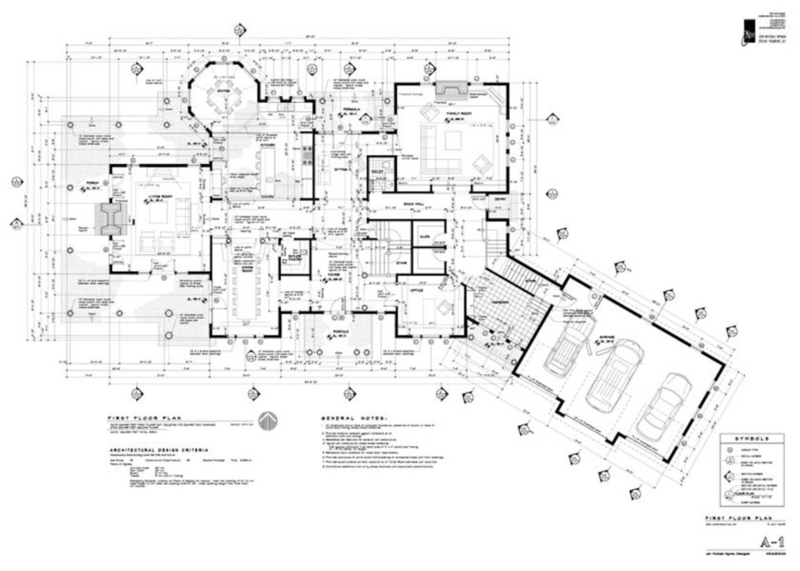 Code information, plans, elevations, sections and details are included in a builder’s set. Finish information, fine detailing and the project manual are left out for the builder and owner to work out together. From a builder’s perspective, imagine drawings prepared by an experienced carpenter with an understanding of construction sequence; foundation, framing, utilities and finishes. Dimensions placed for the framer to the edges of studs, showing wall thickness rather than centerlines, locating toilets, tubs and shower drains and indicating jack studs and headers on framing plans. Framing start points, accurate dimension strings that verify room and overall building sizes and positioning windows by centerline to allow for manufacturer substitutions are all a must. Our building experience works for you, giving you time for other aspects of the project and providing for fewer costly mistakes.